Mantle as we know it is no longer there, but it appears that Vulkan API is actually the next evolution of Mantle. 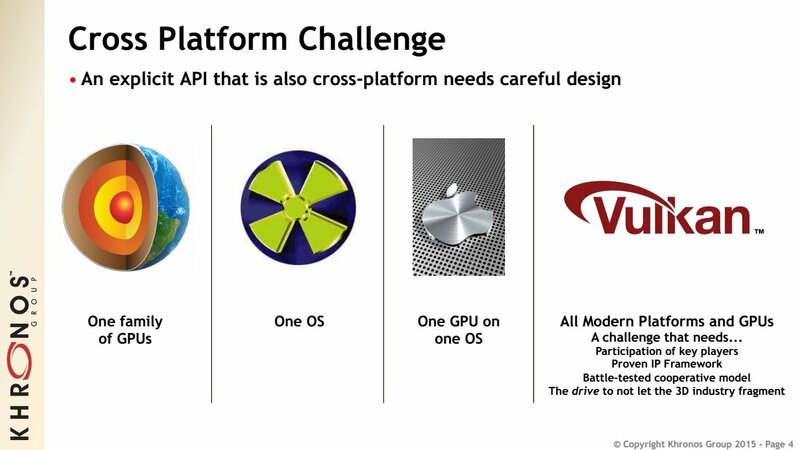 AMD has already advised developers to shift to DX12 or Vulcan API. And since DX12 is proprietary that literally leaves one API for the open world: Vulkan. AMD then further went on to reveal that Vulkan had actually absorbed all the best features, hinting at Vulkan being the true progress after Mantle API. AMD has mostly been a very vocal advocate of open standard technologies unlike its notable rivals Intel and Nvidia which mostly rely on a proprietary ecosystem. However, when you are going with an open standard and API is the name of the game, the Khronos group is an obvious ally to have. Infact, an almost critical one. Therefore, in hindisght, it would appear to me that this is something that isn’t really unexpected. AMD and Khronos worked closely on Mantle API and many parts of it, and it remains to be seen how many, became Vulkan. “The cross-vendor Khronos Group has chosen the best and brightest parts of Mantle to serve as the foundation for Vulkan,” said Robert Hallock, the head of global technical marketing at AMD. “Vulkan paves the way for a renaissance in cross-platform and cross-vendor PC games with exceptional performance, image quality and features,” stressed Mr. Hallock. Basically, Mantle as we knew it, is no more. However, the API still exists and the partially developed ecosystem does as well. To put it bluntly Mantle API has split into two offshoots: the Vulkan API, champion of the open world and Mantle API as it is now, a relatively proprietary system that will only appear in select use cases. Its an interesting and in some ways ironic turn – although something that should have been expected. AMD has so far not revealed its explicit plans for the future of Mantle API but that is something I would be really interested in knowing. AMD has stated that the Mantle project is not dead and will evolve into something new and unique, and it is with this hopeful note, that we can say that we might not have seen the end of Mantle just yet.